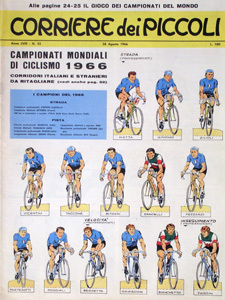 Track cycling game offered with the september 23rd, 1962, issue, as the cover of the magazine. It was titled "Il Vigorelli" after Milano's famous velodrome. 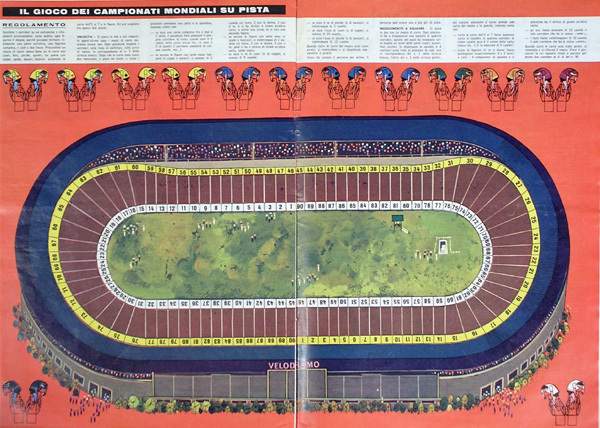 It was included again in the inside pages of august 28th, 1966, issue, this time called "Il Gioco Dei Campionati Mondiali su Pista". We are presented with a nice track of 90 squares and eleven riders, and the possibility to play two races: Sprint and Team Pursuit. We will also need a deck of cards. Any number of players can take part, but a second deck of cards will be needed if there are more than two players (er… not really: that’s what the rules say, but they also say that you reshuffle the cards when all have been played). The players draw one card at a time and then play it. Any number between two and seven advances the rider the number of squares shown in the card. Red FIGURES are bonuses (one, two or three extra squares, plus redraw). Black FFF are minuses (one, two or three squares backwards, but redraw nevertheless). Some cards (aces and kings of hearts and spades) are bonuses or minuses of 5 (kings) or even 10 (aces) squares. The length of the race can be of one or more laps. Game for two players. Each team has four riders marke with hearts, clubs, diamonts and spades. The four riders of each team start on the same square, each team starting at opposite ends of the tracks. Again, the players draw one card at a time and then play it. Any number between two and seven advances all the riders in the team rider the number of squares shown in the card. Queen and king represent a bonus of two or three squares for all the team plus redraw. Aces represent 10 extra squares for the rider of the same suit. Js (valets) represent a penalty of 10 squares backwards for the rider of the same suit. The winner is the first team to have two riders that complete one lap.